After the Battle of Chancellorsville ended in the American Civil War, it actually looked like the impossible was going to happen. It looked like the Confederacy might win their independence as a separate country from the United States. But the South only had a couple of days to celebrate. 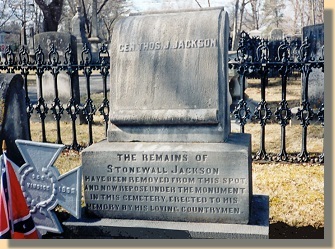 Shortly after the battle, their great hero, Thomas “Stonewall” Jackson died. See, Jackson had had a really successful day of battle, but he had started late, so he hadn’t been able to finish up the job. He went out at night between the lines to scout things out. He was actually contemplating some fighting at night. As he rode back to his own line, his skiddish men fired on him. His two aides died instantly. Jackson was shot twice in the arm, had to have the arm amputated, and eventually died of pneumonia. I always wonder about those men who essentially killed Jackson. Were they beaten up after their mistake was discovered? Did they live with that moment for years after? One thing is clear. The men were too quick to act and not quick enough when it came to thinking through what they were about to do. You could learn a lot from them when it comes to online engagement. When you send out a tweet, a Facebook status, or now a Google update, you are sending things out into the ether of the online world. The world you are shooting into is the way that world looked when Stonewall Jackson was confidently riding back towards his own men. There is an air of tension. There is an air of excitement. And it’s dark. The temptation is to speak quickly online. If you don’t like something or if you think something is stupid, you need to say it right away, before that tweet you’re reacting to disappears forever. The problem is the same as Jackson’s men faced too, and the repercussions could end up very bad for you or your company. What if the wrong person sees that tweet full of unpleasantness? What if you insult someone accidentally whom you really care about? What if the word gets around that you’re kind of a jerk when you’re really not? Yes, the online world is magnificent for growth. But one wrong move can also undo everything you have built up to this point. It can destroy the hopes you had for that relationship. It can destroy any chance of you sealing that big deal. Well, he probably wouldn’t have exactly said that, but the sentiment would have been there anyway. The list goes on and on. All very simple things. All very easy to do. Or not. Don’t let yourself become some nameless person in history who did something so incredibly stupid and hurtful that you actually don’t merit the credit for doing it in the minds of future generations. Don’t shoot your great hope in the left arm. Twice. It’s even worse than shooting yourself in the foot. This is post #89 in the Engagement Series. I thank you for reading! I always try to tell people that history is so much more than dates…I wish schools didn’t teach it that way. Glad you like history now…and yes, the death of Stonewall Jackson, like so many stories from the Civil War, is almost too ridiculous to believe. Crazy, crazy events took place, and they all ended up defining our country the way it is today. I continue to be fascinated by the connections you’re able to make (this one had the added bonus of making me a tiny bit nostalgic because I used to live in Fredericksburg and thus have visited the Stonewall shrine a number of times 😉 ). Very good advice here. Great advice Margie and very well said. I find myself thinking these things as I read people’s blogs, tweets and interactions in chats as well. Is this really the way you want people to think of you or what kind of person you are? The #Blogchat discussion on “trolls” still has me thinking as well. Thought is the name of the game, really. Thinking before tweeting is especially difficult because it all moves so fast. But boy is it important! Marie – I recently discovered your blog and I’m hooked! really appreciate the good advice especially using the historical context. So glad to hear it, Jay. Thank you! I like to make clear examples, so that works out really well! And I’m glad I succeeded this time! So now. We await #90. What an unbelievable accomplishment! You should feel rightly proud. I love the analogy and the message of this post. It is very easy to send the wrong message in print. It is very easy to take away the wrong message from what others say. Your “safety measures” are a great guide. In business, I always try to remember not to send emails when upset. Posting on the Internet has even greater repercussions. You actually made me think of another historical analogy: Pres. Lincoln wrote a scathing letter to one of his generals (I think McClellan or Meade???) — tore him a new one, so to speak. They found the letter in Lincoln’s papers when he died. He wrote it, but thought better of it and never sent it. We should all remember to take that pause. Great post, and good to be here!